Hello beauties! I am back after a short break with a review for a face scrub. If I could, I would use a face scrub every single day because I love how my skin feels super soft and smooth post exfoliation. The dead skin cells, dirt, grime are all gone and the fresh skin underneath is revealed. But it's adviced to not use a face scrub more than 2-3 times a week as our skin is sensitive and too much exfoliation does more harm than good. Today I will be reviewing a face scrub from the house of Pure Suds. Let's see how the product fared for me! 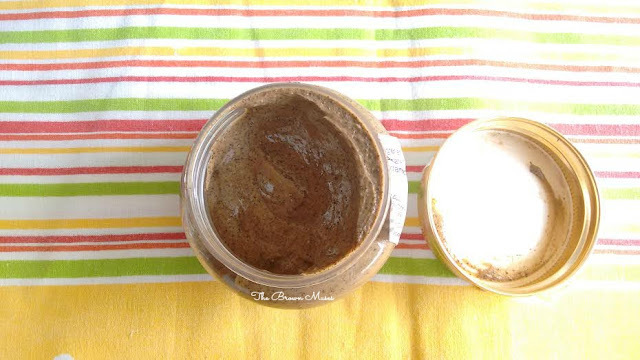 Cocoa coffee brightening face scrub is a multi purpose face scrub suitable to all skin types. 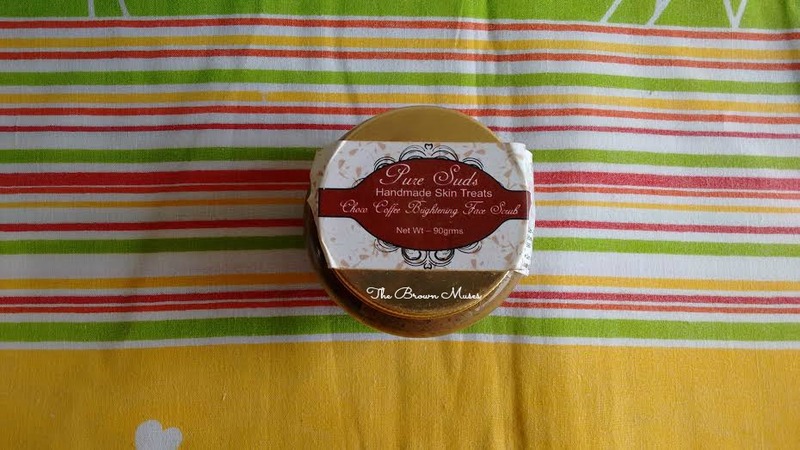 Handmade with love it is made with skin loving oils such as Golden Jojoba oil, Almond oil, Castor oil and grape seed oil along with fine cocoa powder and ground coffee bean for deep cleansing and exfoliation. Cocoa and coffee together work as antioxidants and help the skin brighten up to its natural color. Also helps with de-tan and removal of dead skin and lightens pigmentation. Shelf Life: 8 months from the date of manufacturing. Packaging: The scrub comes in a plastic jar with a gold coloured screw lid which shuts tight and is sturdy enough to be travelled with. And yes, it's spill proof too. Pure Suds Choco Coffee Brightening Face Scrub smells divine. I mean when I took the first whiff it smelled exactly like Melody Toffee which we used to feast on back in the day. I fell in love with the scrub at that very moment and I knew I would like it. I had used the scrub previously too when it came in a red jar. The current scrub comes in brand's new packaging with a reformulated recipe. The scrub has a thick consistency and gets its brown colour from cocoa powder used in it. The scrub looks like chocolate paste lol. I mean it seriously does!! The scrub gets it exfoliating action from ground coffee beans. I use the scrub 1-2 times a week. To use I take desired amount of product in my palm and scrub my damp face gently, post rinse I totally totally love how the skin feels, in fact I feel the scrub does a great job after I have washed my face with a gentle cleanser and pat it dry. I gently massage the scrub all over my face and it does a really great job. My skin feels as soft as a baby's and the presence of ground coffee beans and cocoa do their magic, my complexion brightens up instantly, so the brand's claim stands true however the other claim which says the scrub would remove sun tan too, I am still in the process of testing it so cannot comment as yet. It deep cleanses the pore from within and doesn't leave any greasy residue or sheen. The scrub is very gentle hence the ground coffee beans do not feel abrasive against the skin however it's not wise enough to massage the scrub harder on the skin as it might damage the skin. The addition of skin loving oils like almond oil, castor oil etc make sure the skin doesn't get dry post use and in fact the scrub is suitable for all skin types. Overall, Pure Suds Choco Coffee Brightening Face Scrub is a great scrub which is super gentle and does it's job really well! The scrub is completely natural and devoid harsh chemicals but a patch test is still recommended. Will I recommend: Why wouldn't I? It's a great product! Handmade, natural and not tested on animals. Smells amazing and looks delicious :P I had to resist myself from licking it. Sturdy and spill proof packaging. 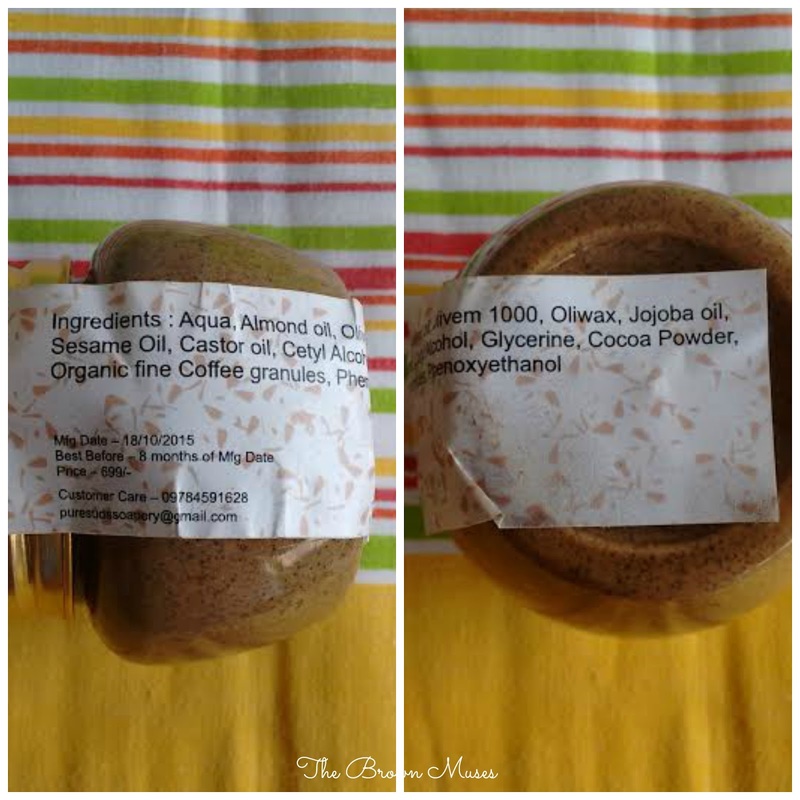 Contains ground coffee beans, cocoa powder and skin loving oils. Instantly brightens up the complexion. Deep cleanses the skin from within and removes dead skin cells. Stands true to almost all it's claims. Disclosure: This product is my own purchase and the views and opinions expressed hereby are strictly unbiased, based on my personal experience.